What is the Clean Growth Strategy the government has put in place? The UK government, as part of its commitment to reduce the nation’s greenhouse gas emissions, has launched the Clean Growth Strategy and outlined its approach on how to build a lower-carbon future for the United Kingdom. The thorough document was compiled by the UK’s Department for Business, Energy & Industrial Strategy (BEIS), and is available to download here. However, if you’re pushed for time, energy experts Flogas, have summarised the 165 pages into a nice and easy read for you. What is the United Kingdom’s commitment to climate change? It’s crucial you understand the background legislation that brought about the Clean Growth Strategy. Ten years ago, the UK introduced the Climate Change Act, becoming the first nation worldwide to have a self-imposed legally binding carbon reduction target. The crux of it? To reduce greenhouse gas emissions by at least 80% by 2050 (compared to 1990 levels). How close is the nation to meeting the target? It’s good news! Figures published by BEIS in March 2017 revealed that the United Kingdom is on course to hit its target, with carbon emissions since 1990 having dropped by 42%. While this progress is encouraging, the government acknowledges that there is still plenty more work to be done – and that’s where proposals like the Clean Growth Strategy come in. 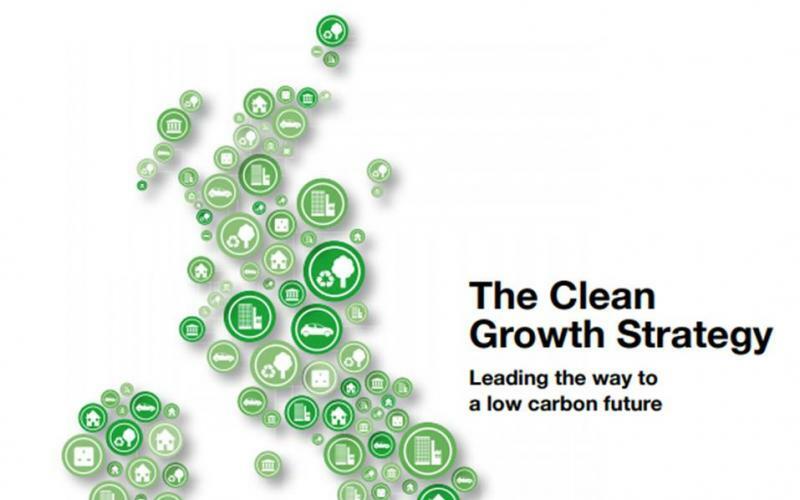 How is the Clean Growth Strategy helping? To turn this vision into a reality, the government has pledged to roll out lower-carbon processes, systems and technologies nationwide – doing so in the most cost-effective way possible for homes and businesses alike. This executive summary shows the full list of 50 pledges. What’s the deal for homes and businesses? The government is essentially going to support homes, businesses, and industrial operations to reduce their carbon footprint. A major focus will be reassessing the fuels we use for jobs such as heating, cooking, and powering industrial and manufacturing processes – and embracing cleaner, greener alternatives. This should help boost the uptake of renewable technologies, including solar panels, biomass boilers, and heat pumpsin the long term. It should also favour cleaner conventional fuels over more polluting ones. For example, for off-grid homes and businesses, the strategy sets out specific plans to phase out high-carbon forms of fossil fuels like oil. As the lowest-carbon conventional off-grid fuel, oil to liquefied petroleum gas (LPG) conversions will play a key part in replacing oil in rural parts of the country. Of course, natural gas will remain a popular choice for those buildings that are connected to the mains network due to its accessibility and affordability. Plus, it’s the lowest-carbon fossil fuel available. Flogas, a gas mains provider in the UK, expects to see this part of its business continue to go from strength to strength. The company, which has been prominent in the energy sector for over 30 years, predicts that the ‘green gas’ phenomenon,in which natural gas is injected with a proportion of environmentally friendly biogas, will continue to grow in popularity as the Clean Growth Strategy is rolled out. Several key industry figures have openly supported the Clean Growth Strategy since its unveiling.